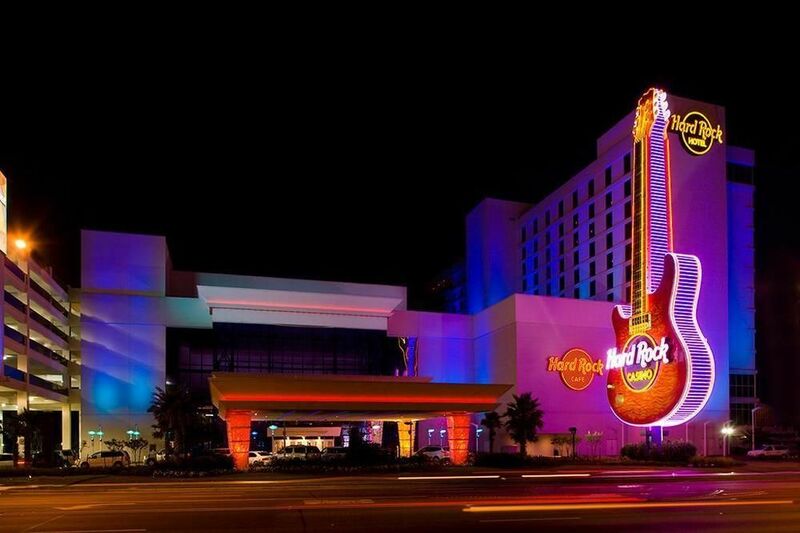 Turn up the amps on your vacation at the Hard Rock Hotel & Casino Biloxi. With everything you need to bathe in VIP Luxurious rooms and suites, from dining to entertainment, gaming and events, Hard Rock Hotel & Casino Biloxi makes sure that every guest takes center stage. For those with the finest tastes, enhance your experience with specials and packages, including the Boogie Package or our Retune Experience. Whether you're looking to get in touch with the musician in you with the Sound of Your Stay program, or seek your fortune in our world-class casino, we are your ultimate destination with everything you need for fun or relaxation. The casino features more than 1,300 slots and 50 table games where you can go for gold. While you're here, keep your body rocking at our state-of-the-art Body Rock Gym®, and after treat yourself to a relaxing massage or facial at the Rock Spa®. Before you leave, be sure to snag a memento to remember your experience from our exclusive Rock Shop®. Ready for some action? Have a talk with Lady Luck and head over to our wide array of happening table games where the action gets better and the wins get bigger. Make it to 21 in a fast-paced game of Black Jack, or roll the dice at the craps table. Take a spin on Roulette, or enjoy a game of Mississippi Stud in the place where it was born. If you're looking for something a little different, spice it up with a game of Baccarat or Pai Gow. Whatever your game, we have 50 tables for you to choose from. So get in the game. Fortune Palace Gaming Area includes an array of popular games including Mini and Midi Baccarat, Pai Gow Poker Progressive and Double Deck Blackjack. Located adjacent to Macau Kitchen and open 24 hours, 7 days a week. Cash in and cash out for hours of endless slot machine enjoyment with over 1,200 of your favorite classic slots, newly released slots, video poker and electronic table games. So take a seat, have a drink, and take the slots for a whirl. The next jackpot could be yours. Experience the tastes of the good life with any of our rocking restaurant and bar options here at Hard Rock Hotel & Casino Biloxi. Whether you're looking for something quick and savory, or you'd rather dress to the nines and enjoy the finery of a three-course meal prepared by world-class chefs, your palate will be satisfied. So tuck in and dig in, because there's always something fresh and delicious to try at Hard Rock Hotel & Casino Biloxi. Half Shell Oyster House - Offering authentic coastal cuisine and local seafood, the Half Shell Oyster House serves up a healthy dose of southern hospitality. Ruth's Chris Steak House - If you want steak, you want Ruth's Chris. At Ruth's Chris Steak House, your meal is specifically tailored to satisfy your exact desires. Hard Rock Cafè - Dig into musical history while you're biting into one of the Legendary Burgers at the Hard Rock Cafe Biloxi. Satisfaction Buffet - Grab a taste of the Gulf culture and cuisine at the Satisfaction Buffet, where flavor rules and ingredients stay local. Macau Kitchen - Macau Kitchen is the Gulf Coast's newest hot spot to indulge in authentic Asian cuisine. 24/7 Grille - Enjoy the roadside delights straight out of some long desert highways they used to talk about in all those songs from the 60s. Pie Five Pizza Co - Pie Five creates custom, personal pizzas with quality ingredients in only five minutes (Pie Five, get it?). Tequilas on The Gulf - You don't have to interrupt pool time to find some food, thanks to our newest poolside restaurant, Tequila's on the Gulf. Soundbar - Lounge by the luxurious world-class swimming pool and dine on expertly prepared dishes and specialty cocktails.